Perennials, to 200 cm (robust, glaucous). Stems erect to subdecumbent. Leaves sessile; blades oblong-ovate to lanceolate or hastate, (20-)30-100 × 10-40(-50) mm, bases connate-perfoliate, margins entire. Heads 25-150+ in paniculiform arrays. Calyculi of 1(-2) linear-lanceolate bractlets ca. 2 mm. Involucres oblong-urceolate, 5-7 mm. 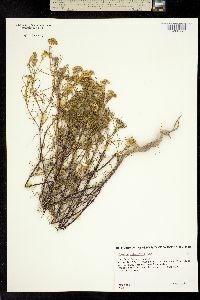 Phyllaries 5, oblong-lanceolate. Ray florets 0. Disc florets 9-14; corolla tubes 1.2-1.4 mm, throats narrowly funnelform, 2 mm. Cypselae narrowly oblanceolate to linear, 2.5-3 mm; pappi usually of 2-4 unequal, hyaline scales 0.2-1 mm, usually on 1 shoulder, rarely 0. 2n = 36. Flowering Jul-Nov. Near saline or gypseous water sources: marshes, springs, creeks, rivers, irrigation canals, and roadside ditches; 700-1700 m; N.Mex., Tex. ; Mexico (Chihuahua, Coahuila, Nuevo León). Flaveria chlorifolia is widely distributed in the northern region of the Chihuahuan Desert and extends up the Pecos River drainage into central New Mexico and the Rio Grande River drainage to north of Las Cruces. The perfoliate leaves, succulent habit, relatively large, flat-topped clusters of discoid heads, and usually 2-4 pappus scales distinguish it. It may be considered primitive on the basis of habit, leaves, and pappus scales. 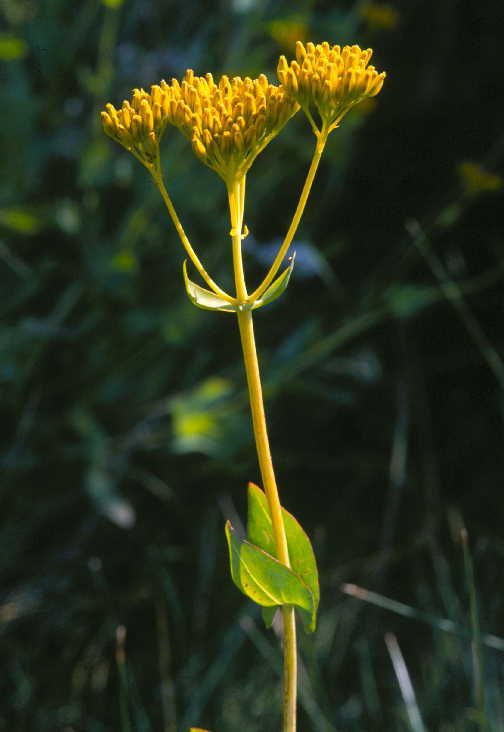 It is not thought to be closely related to any other species of Flaveria.